Wedding garters represent a tradition that goes back centuries. As part of your reception celebration consider one of our wedding garter sets, with two wedding garters � one to throw and one to keep. With numerous designs to choose from you're sure to find one of our wedding garters that best matches your personal taste, style, and theme. 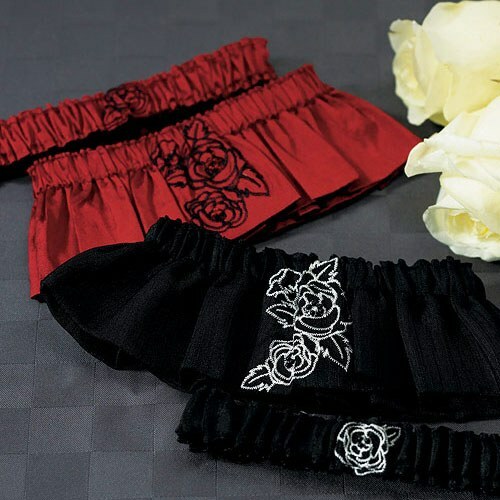 Foreverwedstore is dedicated to providing the highest quality selection of wedding garters available. In a range of colors with numerous embellishments and details, the wedding garter set that you have in mind is here. You can be sure that your family and friends will get a kick out of seeing your wedding garter thrown at your reception, which is reason enough to select one that you want people to see. We also offer a selection of plus size wedding garters to be used with your choice of wedding garter belts. Crafted with the utmost attention to detail, our wedding garter sets, including our plus size wedding garters, are both elegant and timeless. Many of our wedding garters are detailed with ribbons, bows, lace and small ornaments, making a special keepsake for yourself and the lucky man who catches your garter in the toss. Also important, you can be sure that all our wedding garters have been designed to compliment a range of wedding garter belts. In contrast to a single garter, our wedding garter sets are an excellent option worth considering because of the variety they're available in. Of the two wedding garters in the set, there is a distinct garter for you and for the traditional toss. Depending on your reception plans, this may be an attractive alternative to a single wedding garter as it ensures you'll have a memento of your own to remember your special day by. As much as they're about looking good, it's also important that the quality remains in any accessory you buy. That's why we take so much pride in all our wedding garters, from wedding garter belts to plus size wedding garters, you won't find more inspired products anywhere else.